Catherine O’Donnell’s highly refined and technically impressive charcoal drawings of the urban environment are a combination of social critique, formalist aesthetics and narrative. She finds beauty and a shared humanity in overlooked pockets of the world that are fundamental to the identity of those who occupy them. 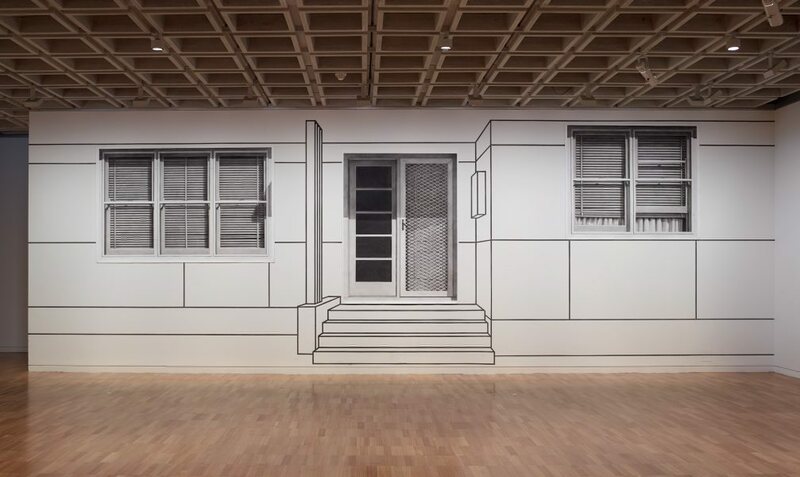 This monumental installation refashions one architectural form, the post-war fibro house of Western Sydney, onto another, the wall of an art gallery. More than an anonymous box with a blank façade, it is very like the home in which the artist grew up and formed her earliest memories. The work’s scale encourages a physical as well as psychological experience in the viewer. There are occasional, subtle visual interferences that imply a human presence suggesting a life, or lives, within. O’Donnell’s method combines working from memory and photographs, as well as close observation.